The Langley Trio are the genuine article. Gita,Rosie and Edie, who are all sisters, have been singing and making music since childhood. 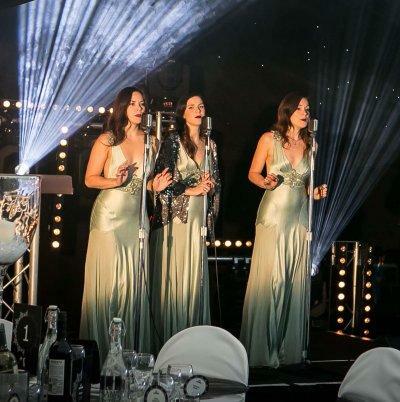 Their close three part harmony group heralds from the golden Hollywood age and their classic renditions of the Andrew Sisters songs and other vintage hits of the 1920’s 30’s 40’s and 50’s never fail to wow an audience. They have performed at many of London’s finest venues and have supported Jools Holland and Paloma Faith on tour. 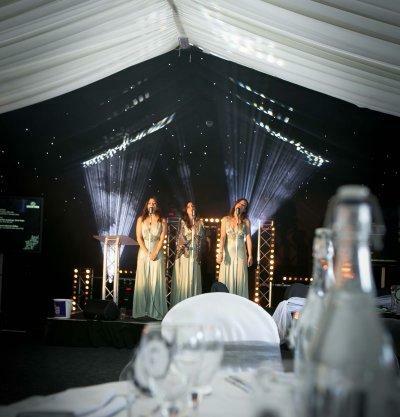 A perfect addition to your corporate entertainment. The Langley Trio perform their songs to backing track, which is pre-recorded by their live band. The handsome Jazz trio are also available to accompany the girls. Performance sets can be tailored to your party needs. 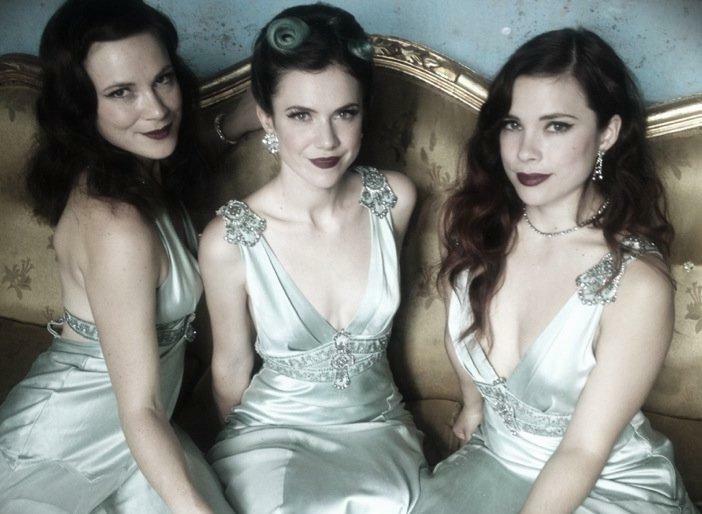 For a twist – The Langley Trio also perform modern songs with a retro edge. Always in keeping with your event, the girls dress in beautiful vintage –inspired silk gowns by Jenny Packham and have a number of eye catching outfits for your chosen ear. They can do an acoustic set with no backing track, which will not require a PA and is really good for small events. Identical outfits: Long pale green silk evening /1930’s style. Black lace Pearl Lowe tea dresses. The girls were wonderful! Mesmerising – absolutely wonderful and a real hit! Thank you for suggesting them to me. A massive thank you to the Langley Trio for their fantastic performance last night. They were absolutely brilliant and that they went down really well with the guests. A number of the guests came up to Andrew after the performance and said how wonderful they were and how amazing they sounded.